Ahmedabad is indeed A treat for the Heritage & Architecture buffs. It is a largest city in Gujarat & is very rich in term of Culture & heritage. There are various places which are rarely explored. Patan, Modhera & Adalaj are few of them. In this Tour, we will walk you through History and you will be mesmerized to find the fine examples of Architecture. Adalaj is famous for its five stories deep Step well which is intricately carved & built in sandstone. Step wells like Adalaj were once integral to semi-arid regions of Gujarat as they provided water for drinking, washing & bathing. These wells were also venues for colorful festivals & sacred rituals. Rani Ki Vav is again an intricately carved step well in Patan which is 130 Kms from Ahmedabad. It is declared as UNESCO’S world heritage Site in 2014. It was constructed in Maru-Gurjara Architectural style during Chalukya dynasty. This magnificent East-facing stepwell measures approximately 64 m long, 20 m wide & 27 m deep. Modhera Sun Temple is a Hindu Temple dedicated to solar deity Surya situated on the banks of Pushpavati River. After Konark, this is prominent sun temple in India. No worship is offered here and is a protected monument by ASI. Apart from these 3 major places, we would be doing a full day excursion tour in Ahmedabad City on Day 2 exploring Various Mosques, Sabarmati Ashram & Temples. 4) Exploring the Famous Siddi Sayaad Jaali Mosque which is known worldwide for its beautifully carved lattice Windows. Day 0, 8th June: Board Train for Ahmedabad from Mumbai at 10 p.m.
Reach Ahmedabad Railway Station by 7 a.m. We will move towards Adalaj Stepwell, which is close to Station. Then we will be heading to Modhera sun Temple. 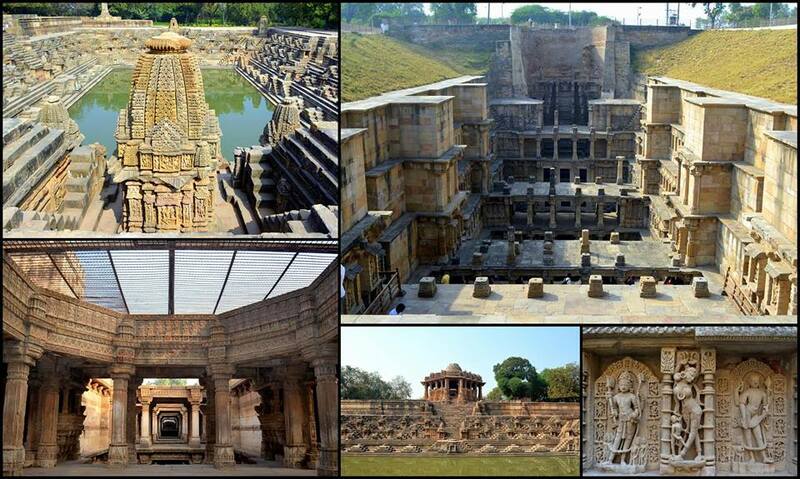 After Lunch, proceed towards Patan to explore the Famous Rani Ki Vav. After a quick visit to the Patola museum & Patola House, we will head back to Ahmedabad. Post Breakfast, checkout from the Hotel. We will be exploring Ahmedabad today. Major Points to be covered: Sabarmati Ashram, Hari ni Vav, Siddi Sayyad Mosque, Sarkhej Roja, Hutheeesing Jain Temple. Move towards Ahmedabad Railway Station by 7.30 p.m. to Catch a Train back to Mumbai. Day 3, 11th Jun: Reach Mumbai by 6 a.m.